Our efficiency in business has set a benchmark for our competitors on the lines of quality and reliability. We promote the sales of premium quality products to give our clients excellent services and true value for money. Our products are reliable and have established themselves as big brand names in the global market. We strive to understand the specific needs of our customers and deliver products in accordance to the exact requirements of our clients. Besides we have a state-of-the-art infrastructure that takes care of any kind of requirements of the bulk orders and enables us for a smooth operation. We deal in the products of only those companies, which have carved a niche for themselves on the lines of authenticity, reliability and quality in their respective arena of operations. For unparalleled services including after sales services, we have an astute set of civil engineers and architects who help the consumers in getting the best result. This in turn, helps us to imbibe confidence amongst our customers. We perpetually endeavour to be in tune with the changing trends and needs of the industry. 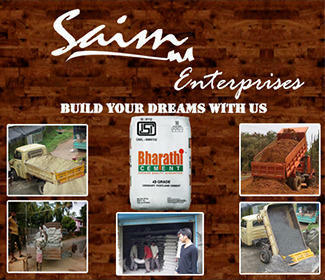 Saim enterprises is the exclusive dealer of Bharathi cement. Initiating in the field of construction, Saim group has flourished in diversified business and service sector. Our end result of our work displays our professionalism, commitment and integrity. Overwhelming demand and encouragement from the customer motivated us to dive in diversified business sector. After a decade experience in construction field, working under leading global company and iconic projects across India and abroad in addition to the construction of numerous commercial and residential villas, schools, religious institutions, etc, shows our capacity to manage real estate sector. The group has set to create new landmarks and niche in the homeland with expertise in engineering consultancy, construction, hardware and clothing retail trading while maintaining our driven tradition of core values, beliefs and ethics.